This kitty is looking for some serious Christmas trouble! Pets like to be at the center of all the family activities, but at Christmas time, there are dangers lurking amidst the fun and decorations! Traditions are important in families. One of ours is to begin decorating for Christmas the weekend after Thanksgiving. I enjoy all the lights and ornaments, but safety is an important consideration when you're putting up holiday decorations - and like small children, pets can stumble into dangerous situations. Many of us think of Christmas as a time for sharing, but there are some things we should not share with our pets. The Christmas tree is one of them. The fragrance of a real tree entices pets; both dogs and cats have been known to try to climb Christmas trees, shattering ornaments, getting tangled in electrical cords. In addition to getting caught in the cords, your pet may try to chew on them, and could end up being electrocuted. Artificial snow is poisonous; tinsel, ornament hooks and pieces of broken ornaments can cause serious internal injury if swallowed, as can sharp pine needles that have fallen from the tree. Water in the tree stand may contain chemicals that can make your pet very sick if ingested. Even artificial trees can pose some of the same dangers. If it sounds like the Christmas tree is a Christmas hazard for your pet, you’re right. The best protection for your best friend is to keep your pet out of the room where you have your Christmas tree unless someone is there to supervise, if at all possible. 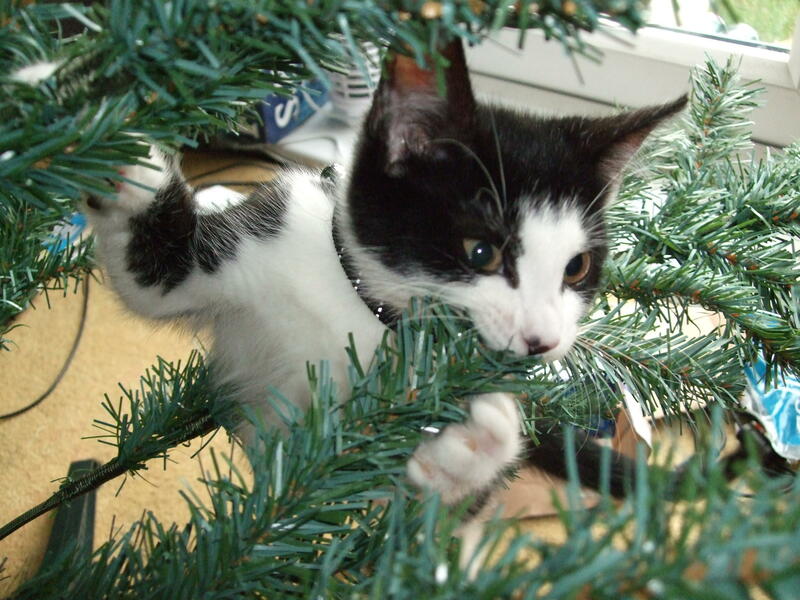 Cats also love to chew on plants, but certain plants and decorations used at Christmas are poisonous. Mistletoe and poinsettia berries are especially dangerous. Holly, philodendron and rhododendron are not quite so lethal, but are harmful, nevertheless. Protect your pet from these decorations, as well. While holiday decorations can be dangerous to your pets, it doesn’t mean you can’t have a Christmas tree or mistletoe this year. Just keep in mind that, especially for your furry friends, there are some hazards that are unique to the Christmas season. Some extra care when decorating can help to keep your holiday happy and safe for ALL members of your household, when you’re speaking of pets.